In a classic case of (ahem) shooting yourself in the foot, Kalashnikov assault rifles have gone on sale to foreign visitors at Moscow's Sheremetyevo international airport. 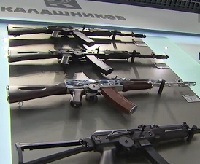 A Kalashnikov boutique has opened to promote the Russian gunmaker’s brand, but an airport official quoted by Reuters said the guns were “clearly imitations” and would not pose security problems. We leave it to readers to guess the reaction of the rest of us.